It will all be okay. : Listen: update on Trump's approval and reversion to the mean. Listen: update on Trump's approval and reversion to the mean. A month ago, I wrote about how Trump's approval ratings were likely to go up, and that this shouldn't surprise anyone or be over-interpreted. 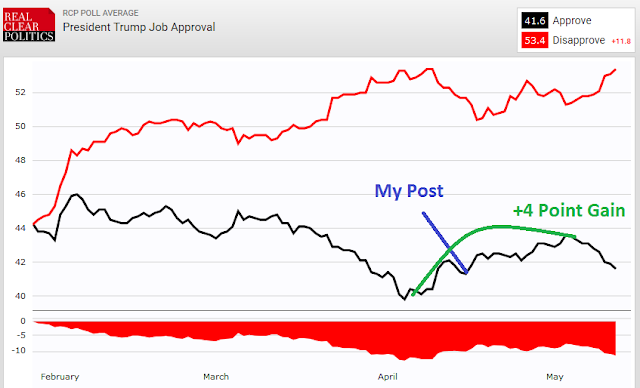 My post arrived near the beginning of a four-point swing in the president's approval, which rose in the unsophisticated RealClearPolitics average a total of four points over the next month. This nearly wiped out all of the losses sustained during a month of mistakes and brutal coverage. It would have been very tempting, I'm sure, to start to panic during that period -- to wonder if the nation was suddenly starting to like their president. But hopefully you remembered the likelihood of a reversion to the mean and the noisiness of polling. And hopefully now you notice that, overall, his numbers remain in decline, and have dropped back down almost to those record-setting lows of April. Stay skeptical and pay attention to context, and there will seldom be a reason to panic.